India vs Australia, World T20, 27 March 2016: Australia had set India a target of 161. It was a virtual quarterfinal, but it turned out to be the same old story that night. Shikhar Dhawan played a rash shot, Rohit Sharma’s dismissal was as soft as it could get. Suresh Raina got the short ball treatment. Yuvraj Singh attempted a half-hearted shot in the air and Shane Watson caught a regulation catch at covers. Maybe Yuvraj was still thinking about his 21-ball 11 in the final of the World T20 in 2014 – an innings which was blamed for India’s loss. However, what followed Yuvraj’s dismissal is still fresh in the minds of all cricket fans. Indian captain MS Dhoni walked in to join Virat Kohli at the centre. It couldn’t get any more assuring. The country’s best chasers were at the crease. But the job wasn’t done yet. India still needed 67 runs off 36 balls to book a semi-final berth. The recovery started. The duo started stealing singles, ones were converted into twos and Australia succumbed to the pressure and gave a boundary almost every over. And then came the James Faulkner over. Kohli went berserk during the chase. While Dhoni, who is also one of the best finishers of the current generation, firmly believes that a match needs to be taken to the last ball, Kohli's has a different approach. He targeted that one over to finish the match off completely. Unfortunately for Faulkner, he had to face the Kohli onslaught. 4, 4, 6, 2, 1, 2. From 39 off 18, the equation was brought down to 20 off 12. But the Indian vice-captain was in no mood to take it to the last over. He hit 16 in the following over and all India needed was four off the last over with Dhoni on strike. We all know what happened next. A low full toss was smacked to the cow corner fence. The hosts won the match and advanced to the semi-finals, courtesy an unbeaten fifth wicket stand of 67 runs between two of India’s best finishers. Fast forward to October: Dhoni’s ability to finish off matches is under question and understandably so. The Indian captain got out on 39 at a crunch moment in the second ODI against New Zealand and India lost the first match of the series. It would be harsh to blame Dhoni for the loss, but with 70 required off just under 11 overs at the time of his dismissal, India had banked on the skipper to complete the task. When he came in at No 5 after Ajinkya Rahane’s dismissal, he had two jobs to do – rotate the strike well, and with wickets falling regularly on the other end, ensure that the asking rate didn’t go out of hand. But Dhoni could do neither, taking 60 balls for his 39, and Tim Southee ended the misery with a fantastic return catch. Hardik Pandya and Umesh Yadav tried their best to deny the visitors their first win, but it was too late. Dhoni opted to bat at No 4 in a couple of matches against Bangladesh, but it didn’t work. He then went back to the old ways of coming down the order. Against New Zealand, again, he declared that he was going to bat higher up the order. And then came the Mohali ODI against the Kiwis. It was almost a replay of what happened against Australia in the World T20 seven months ago. Rohit was trapped LBW to a Southee off-cutter. The Punjab Cricket Association Stadium erupted in joy as Dhoni came out to bat and not Manish Pandey at No 4. 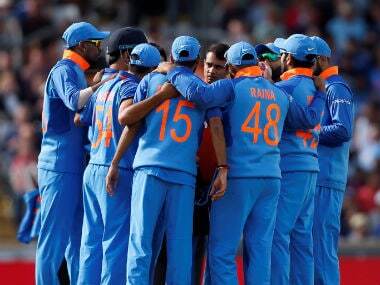 The Kiwis had a certain plan against Dhoni and they started it almost instantly. And it seemed that the Indian captain knew about their ploy of bowling short balls as he attacked each and every bouncer that came his way. And by the time Kane Williamson realised that the strategy wasn’t going to work, Dhoni had achieved three things – he had become the fifth Indian batsman to score 9,000 ODI runs, scored his 61st ODI fifty and ensured that India were on the right track for the chase along with his deputy Kohli. Dhoni got out on 80 to a rather loose shot, but the 151-run partnership for third wicket between Kohli and him ensured that the platform was set to finish the match off. Kohli got to his 26th ODI ton, but hardly celebrated because he knew his job would be done only when India got to the target of 286. He chose Trent Boult for special treatment as he smashed 22 off the left arm bowler's last over. His onslaught ensured India needed just one off 12 balls. The winning shot followed just like it did during that virtual quarter-final in the World T20 against Australia, but this time around, the winning runs weren't hit by the finisher we all are used to, but it was the Karnataka batsman Pandey who whacked Matt Henry for a four towards mid-wicket. In hindsight, Dhoni's tactic of coming up the order seems excellent. But, if you do a survey on how India can solve their problem of finishing, the unanimous answer would be that Dhoni should bat high the order. Finishing the game – whether it is a T20I or an ODI – is the most difficult chore on the cricket field. Dhoni is past his prime, but a youngster filling his shoes immediately is still inconceivable. The likes of Kedar Jadhav, Pandey and Pandya need time to realise their exact roles. And they would be afforded that time only if Dhoni bats high in the order, which will also create fear in the minds of the opposition. Everybody knows that Kohli loves to chase, but it’s not too well known that Dhoni comes second in the list of highest batting averages while chasing, behind Kohli, beating the likes of Michael Bevan and Michael Hussey. And India’s chances of winning a match double, whether they are batting or fielding first, when two of their best batsmen play out the maximum number of overs. One hopes Dhoni now consistently bats high in the order, having acknowledged that coming down the order has hampered his game. “I am happy to score runs. I wanted to do this (play an innings like that) for a long time. I could express myself today. It doesn't happen at number five or six. Batting lower is hampering my batting to a certain extent,” he said after India won the third ODI by seven wickets to lead the series 2-1. In my preview of the India-New Zealand series, I had mentioned that it’s time for Dhoni to be selfish and come up the order and he admitted to have done so in the Mohali ODI. “One has to see that I am not playing Tests anymore. Lower down, I play according to what the situation demands. Batting at number four was an ideal position to express myself. It is more of my need than the team's. There are other guys who can play at four too but we need to think about grooming batsmen to bat five, six and seven,” Dhoni said. If this is a permanent move, the youngsters would get a chance to prove their mettle when either of Dhoni or Kohli fails, but the pressure on them would be much less as there is a fair chance that either Kohli or Dhoni would be batting at the other end. On the other hand, when Kohli and Dhoni get going, they will create a platform for the lower middle-order batsmen, who then can just come in and express themselves like Pandey did in his innings of 28 in the third ODI against New Zealand. If the World T20 victory over Australia was the hint, the Mohali ODI was a testimony that, Kohli at No 3 and Dhoni at No 4 is the answer to India’s finishing woes. This would not only ensure a strong middle order, it will also guarantee that it provides youngsters the time they need to flourish as finishers.